← USA: Pet cat kills pet cat. Man kills cat. Cats often get a raw deal compared to dogs. Declawing is an example. Another example is cats kept inside full-time or cats being shot at with bullets in the USA and air gun pellets in the UK5. There appears to be more feral cats than feral dogs in Europe and feral cats are often poisoned and persecuted in ways that the dog is not. I may be wrong but my feeling is that the cat is generally worse off than the dog. As “pets” they are about equal in number worldwide. So what about dog poo? What about kids mauled to death by dogs? Sixteen British people – often kids – have been killed by dogs since 2005. Each year in England, there are 6,000 hospital visits due to attacks by dogs2. There are discussions about introducing a life sentence for a conviction of a person who owns a dog that kills a person. Currently the maximum is a two year sentence. Cats don’t kill kids. A cat might scratch someone and they might moan about it for ever and a day but that is not the same thing and the reason will be carelessness by the person (dogs killing people is also about irresponsible human behavior). Dog poo can cause toxocariasis in humans. This is a serious illness, which can cause blindness. It is caused by the roundworm in the dog’s intestine. The roundworm eggs can contaminate the soil in parks. Of course, children are at most risk, once again, because they play on the grass3. Most cats poo in the cat litter, which is inside the home and cleared up in a controlled way by the cat’s caretaker. Ninety percent of the time domestic cat poo is never anywhere near anyone except the cat’s owner. Whereas, in the UK (and elsewhere?) dogs nearly always poo in public places; on the pavement or on the grass in parks etc. The modern trend is for people to pick it up and place it in a receptacle somewhere. You see them in parks. This is a fairly recent development but apparently this modern and welcome habit is not universally adhered to by dog owners. In the UK, it has become illegal for a dog’s owner to not remove dog poo from public places. That law may apply across the board to all local authorities. I am not sure. 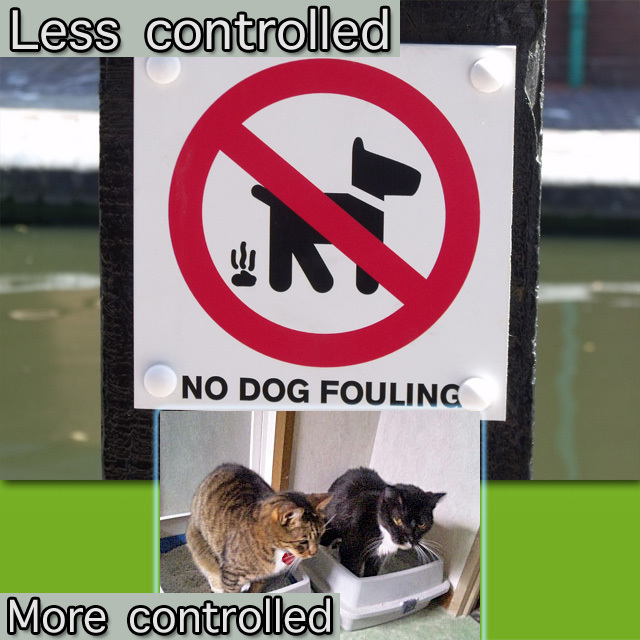 However, local laws regarding dog fouling are difficult to enforce. Where there is no CCTV, a person is liable to be careless and break the law. Also the fixed penalty on the spot fine is just £751. In Finchley, London, for example, you have to wade through it on the streets 😉2. Well, not quite but dog poo still presents a hazard to the general public especially in parks. You want to sit down in a park and have a picnic. Don’t do it until you have made a careful inspection of the chosen area. Then there is dog pee. I can still remember living in Paris in the late 1970s, early 1980s, walking on the pavement and picking my way through the rivers and tributaries of dog urine flowing from the wall of buildings on one side and the gutter on the other. I like or love all animals. I like dogs so please don’t misinterpret what I am writing. I simply wish to redress the balance between cat and dog a little. Put the record straight. Over and over again we read about cats being a hazard to our health and to wildlife. Let’s not criticise dogs in the press let’s but, instead, let’s criticise cats less. And if we do want to criticise dogs let’s first start with looking – with a critical eye – at how people look after their dogs, train them and act irresponsibly towards them. Going to the root of all “pet problems” is the human. Let’s work back to people and resolve the problems without hurting dogs and cats. Times Newspaper 10th Aug 2013. Picture: dog fouling picture by ell brown (Birmingham, UK). Cats in litter: sorry, lost the credit. I realise that dogs are sometimes unnecessarily shot by police officers in the USA. This entry was posted in Cat Behavior, cat litter, Cat Products, defecating, Human to cat relationship, Toxoplasmosis, trained cat and tagged cats vs dogs by Michael Broad. Bookmark the permalink. I’ve rescued both dogs and cats but I’ve stopped taking dogs in because they really are too much trouble.Lovely as they are and can’t help it they are hard work picking up their poo and trying not to let their barking aggravate neighbours. I don’t know if it’s true but everyone and everything seems to have got noisier these days including dogs yet it’s cats that get all the hateful press reports. Yes it’s a much noisier world now and it seems we just have to accept it whether we like it or not. The trend here in the North seems to be for bull terrier type dogs that do that strangled sort of barking and whining, not very attractive dogs to me at all. I love dogs but they are a menace to society where we live. There seems to be more people keeping them outside day and night and they bark constantly. The owners seem to think we all have to share the noise without complaint just because they choose to shut them outside. Why have a pet and keep it outside? It doesn’t make sense. There are doggy poo bins around here and some people use them but a lot don’t bother, they know they are unlikely to get caught, they only pick it up if someone is watching. Then there’s the ‘he men’ who challenge you with a stare daring you to say anything as they walk off with their macho bull terrier type dog leaving a stinking heap behind. Yes a lot of dog owners leave the mess where children play or where people will get in on their shoes. Maybe some cat caretakers are irresponsible too but at least a cat covers his poo. You are right too Michael, cats don’t kill people. It’s time cats stopped getting all the bad press when dogs are a danger and a nuisance in many ways. But as always it’s not the animals fault, it’s the person who fails to look after them properly.